Lama Gyamtso aka Lama Ngodrub Gyatso Rinpoche (b. 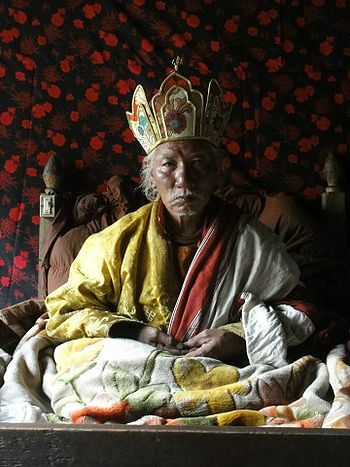 1942) is a senior lama based in Namkha Khyung Dzong (Nepal) and a main holder of the Dudjom Tersar lineage which was spread in the western part of Tibet by Degyal Rinpoche, a direct student of Dudjom Lingpa. Lama Ngodrub Gyatso Rinpoche was born in 1942 in Tibetan Nepal border. He is one of the senior students of Golok Serta Rinpoche, of the Second Degyal Rinpoche and of Tsogkhang Rinpoche, and also a direct teacher of Shiva Rinpoche. Lama Ngodrub Gyatso has spent almost all his life in retreat, having completed six traditional three years cycles of closed retreat. He is one of the greatest expert of the Tröma Nakmo practice of the Dudjom Tersar lineage, from the ritual aspects of the practice up to the highest Dzogchen teachings. Until recent years, Lama Ngodrub Gyatso was spending most of his time in retreat or leading drubchens and what not traveling much. Before his passing, Shiva Rinpoche asked him to share his knowledge with Russian students and take care of his Russian students. Lama Ngodrub Gyatso has two sons, Lama Kelsang and Lama Drakpa. This page was last edited on 3 November 2015, at 13:54.